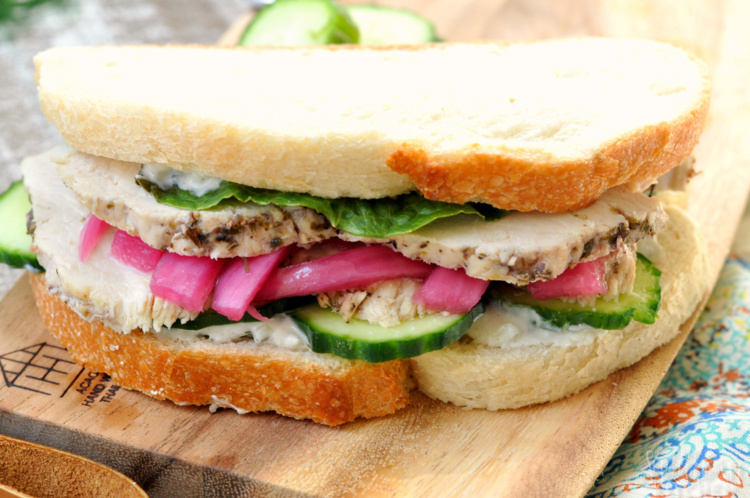 A Greek chicken sandwich has all great flavors of a Greek salad but in the perfect lunch form. Take it on picnics or just in your lunchbox to school or work for a yummy lunch you’ll be counting down the minutes until you can enjoy. A crazy delicious sandwich recipe is something everyone should have in their recipe box. 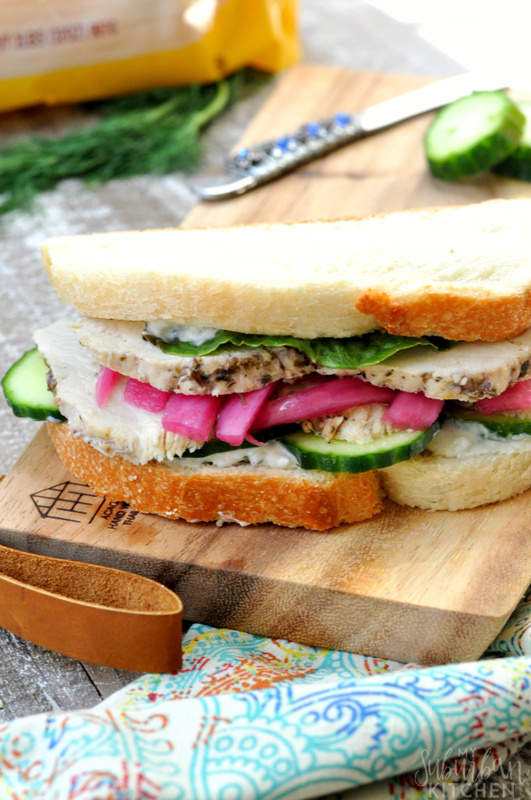 This Greek chicken sandwich is perfect for picnics, as the star of your lunchbox, or even cut into quarters for party appetizers. You can even make the two main items ahead of time to save time when you ready to enjoy it. I played around with this the ingredients in this Greek chicken sandwich when I was developing the recipe for my green goddess vegetable sandwich. My husband has to have meat in his sandwiches so I knew I would need an option for him while I was enjoying the all vegetables in mine. The sauce is what makes this sandwich totally sing in your mouth. You can make it ahead of time and then plan to eat it on just about everything. Feel free to change up the vegetables on the sandwich but I adore the cucumber, quick picked onions and romaine that is on this one. 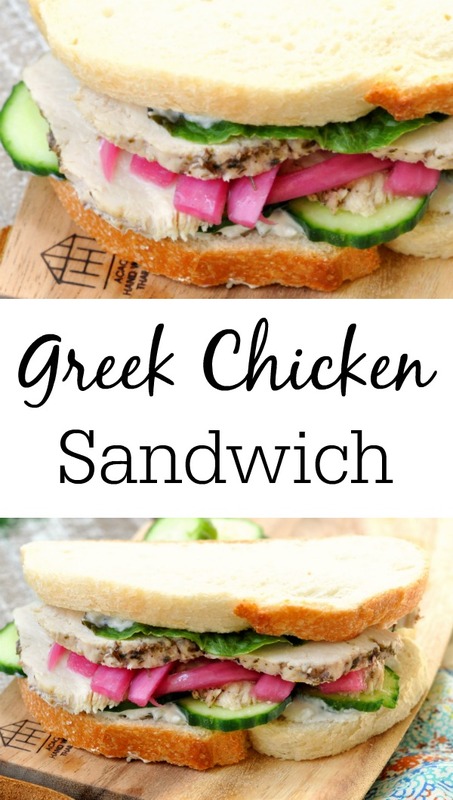 If you make this Greek chicken sandwich or any other recipe from the blog, I’d love to hear about your experience. Let me know if the comments or snap a photo and tag it #MySuburbanKitchen on Instagram or Twitter. 1. 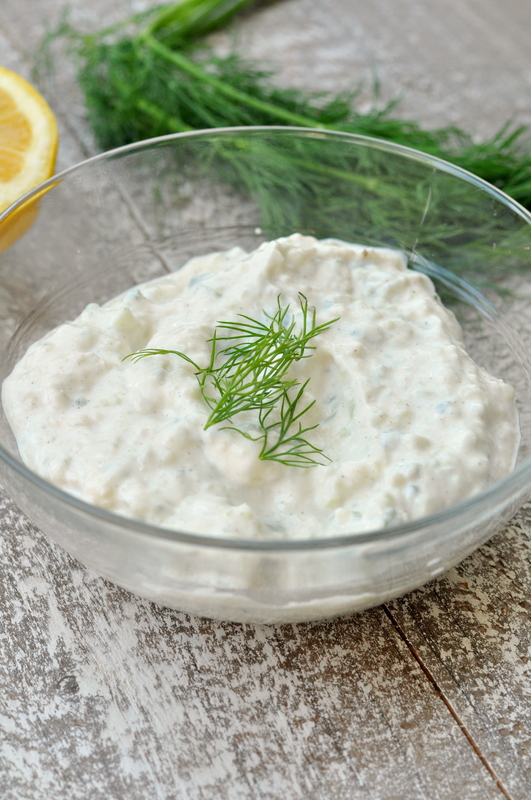 To make the sauce, combine yogurt, minced cucumber, lemon juice, olive oil, garlic cloves, dill and salt in medium bowl. Stir well to combine. Refrigerate. 2. Preheat oven to 375 degrees. For the chicken, whisk together red wine vinegar, olive oil, garlic clove, oregano and rosemary in a medium sized baking dish. Add chicken breast, turning to coat. Cook in oven for 15-20 minutes or until chicken is done. Remove from oven and let cook. Slice into thin slices. 3. Assemble sandwiches: Spread sauce on each interior side of bread. 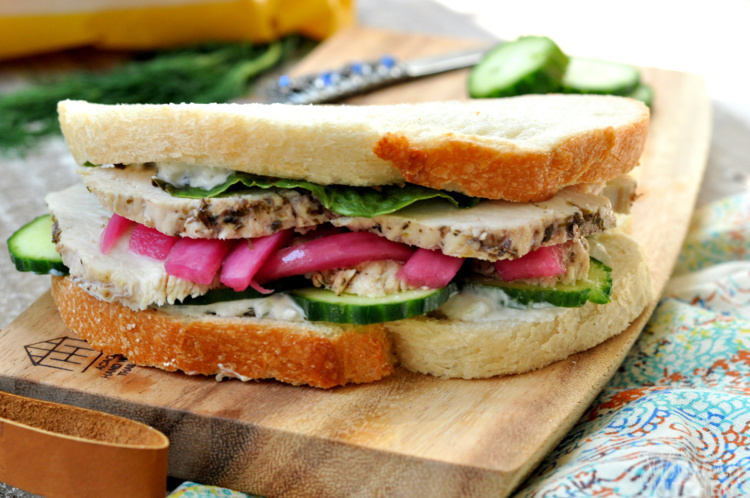 Top with cucumber slices, chicken slices, pickled red onions and romaine lettuce. 1. The sauce can be made 1-2 days ahead and kept refrigerated. 2. The chicken can be made 1-2 days ahead.